Structural abnormalities of the X chromosome may lead to different phenotypes, depending on the chromosome region affected. 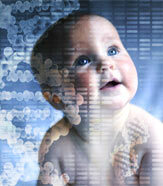 We report phenotypic findings of two patients who had X chromosome du­plications. One had a menstrual irregularity, a low hairline, cubitus valgus and suffered from dyslexia. The other had multiple congenital anomalies, severe mental-motor retardation and intractable epilepsy. The karyotypes were 46,X,dup(X) (p11.3p21) and 46,X,dup(X)(q13q25) respectively.